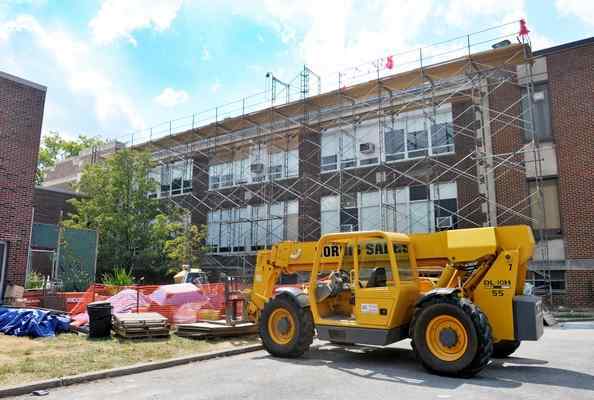 The Norristown Area School District indicates renovation projects at both Stewart Middle School, above, and Eisenhower Science and Technology Leadership Academy are on track to be completed in the fall. Both buildings are receiving a number of major improvements, including new roofs and windows. Masonry repairs are also being done to the buildings and a new mechanical system that will provide air conditioning for the buildings is being installed. Prior to the renovations, the two schools were the only buildings in the district that did not have air conditioners. Construction started several weeks before school let out and is expected to be completed in time for the start of the new school year. “We look forward to showing off the updated buildings to our students and families next fall,” said Norristown Area School District Chief Financial Officer AnneMarie Rohrict.